Our hotel is in a central position, at the begninning of a pedestrain zone, on the main road (see also the map). It gives the chance to the customer to be close to the amusements of downtown area and on the other hand to stay in the peacefullness of an area far from cars and pollution. By car on the Highway A4 MI-VE take the the exit “Padova ovest”, the new circumferential highway will take you directly to Abano Terme downtown, otehr whise from Highway A13 BO-PD take the exit “Terme Euganee”. 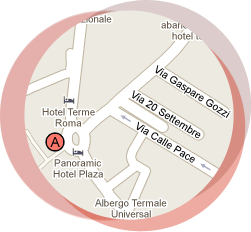 By train: get off at “Padova” station, take the bus to Abano T. that will bring you straight forward our hotel. The undersigned declares to have read the information pursuant to articles 13 and 14 of Legislative Decree 196/2003 and articles 13 and 14 of EU Regulation 679/16 and expresses the consent to be contacted.